The University of Maine at Farmington baseball team notched a 6-2 win over the University of Maine at Presque Isle in the opener of its non-conference twinbill, but fell 12-6 in game two at Thomas College's H. Allen Ryan Field today. The Beavers (2-15) are scheduled to host Lyndon State College Saturday at 2 p.m. for a doubleheader. The games will be played at Thomas due to unplayable field conditions. The Owls (4-19) are headed to Vermont to face Vermont Tech Saturday at 1 p.m. In the opener, Ian McAlister (South Berwick, Maine) twirled a three-hitter and singled twice to guide the Beavers to a 6-2 win. McAlister struck out five in the complete game for his first collegiate win. Trailing 2-1 in the fifth, Josh Garneau (South Portland, Maine) tied the game at 2-2 for the Beavers with an RBI single and scored the go-ahead run when he worked his way around the base paths on an infield single by Matt Levine (Pelham, N.H.) and a pair of UMPI overthrows. Garneau finished with three singles and two RBI, while Russ Schmelzer (Winthrop, Maine) also had a pair of hits and Levine drove in two runs. Shane Smith (Farmington, Maine) gave the Owls their 2-1 edge with a two-run single in the third. Jordan Perry (Baileyville, Maine) took the loss for UMPI with nine hits allowed, three walks and four strikeouts over 5.1 innings. In game two, the Owls batted around in the sixth to score five runs and plated three more runs in the seventh to snag a 12-6 victory from the Beavers. UMPI's output in the sixth was keyed by a pair of UMF errors and four hits, including a two-run single by Carlos Villoria (Caracas, Venezuela). 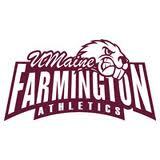 Levine and Schmelzer each singled three times for UMF, while Zach Keene (Livermore, Maine) clubbed a double. A two-run single by Ed Flaherty (Baileyville, Maine) highlighted a five-run second for the Beavers which gave UMF a 5-4 edge. Patrick Wrigley (Oakland, Maine) was hit with the loss with four hits allowed, a walk and a strikeout in two innings of relief. Only one of the 12 runs scored against the Beavers was earned as UMF made six errors. Villoria smacked two singles and a double for UMPI with Ted Walker (Caribou, Maine) supplying a double and Matt Nadeau (Auburn, Maine) two singles. Anthony Batchelder (Enfield, Maine) hurled a complete game, scattering 11 hits with a single free pass issued. Pitchers: Me.-Presque Isle - Jordan Perry; Evan Kingsbury(6). Me.-Farmington - Ian McAlister. Will Griffiths(3); Patrick Wrigley(5); Alex Goldrup(7).